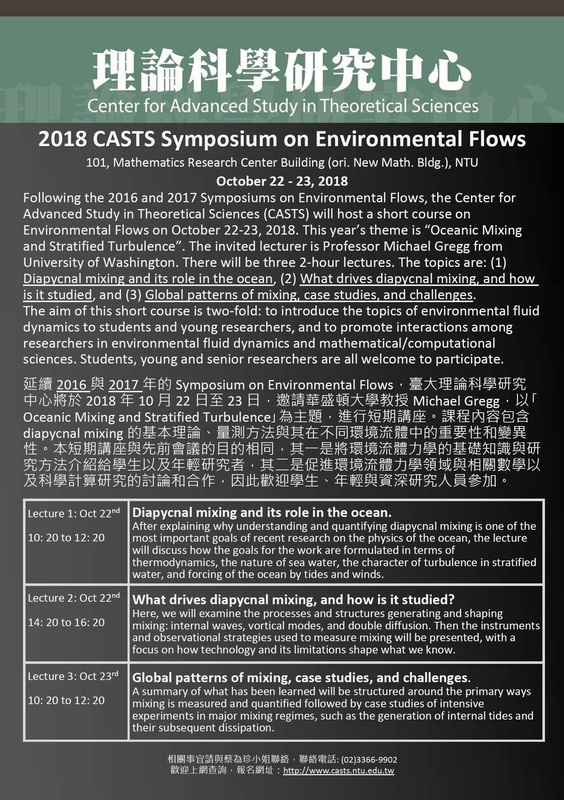 On October 22-23, 2018, Prof. Mike Gregg of University of Washington will give a short introductory course on ocean mixing at NTU. Mike is a pioneer in measuring microstructure in the ocean and has made important contributions to our understanding of oceanic mixing and turbulence (especially in linking open-ocean mixing rate and internal waves, which led to the prestigious Henry Stommel Medal). It is a rare opportunity to have him in Taiwan. We would like to invite you to come to the lectures. Everybody (PI, RA, students, etc) is welcome. 10/22 14:20-16:20 (數學中心 R101) Lecture 2: What drives diapycnal mixing, and how is it studied?